In our district, 4th Quarter is research quarter in ELA. Now really, every day is research day anymore, but this is where we do the deliberate instruction of skills for an extended project. In past years, students did a traditional research paper; last year, I added a digital presentation to that paper and honestly, those were more fun to review than the papers. This year, my co-teacher and I decided to skip the paper (though it is an option for anyone who wants to take it; it hasn’t gone away for good) and do an “extended research project.” A new step for the students is creating an annotated bibliography for their sources. What a packed assignment! Finding sources, initially analyzing for usefulness, taking notes on ones that pass the first step, summarizing the source, and putting it all into APA format takes a lot of work. Once that is done, the next step is to make a useful project out of the information to answer whatever research question the students self-selected. Our goal, particularly in middle school, is to have students test out a variety of ways to “show what they know” so that as we more completely move into the personalized learning initiative our district has (thankfully!) embraced, the kids have skills to really personalize. As an example, this annotation relates to the read aloud the middle school is doing, The Wild Robot Escapes. It’s a little short; it could be two paragraphs with the second one relating more about how the source relates to the (undisclosed) research question. My goal was to blog once a week about Genius Hour as we did it in class. I got one week. And I think there is a draft in here somewhere for week two. But then this poor blog falls fallow, like so many other years. Well, my new co-teacher is planning on blogging once a week and I am going to use her to keep me accountable. Necessity: I am starting my third week out of the classroom, unplanned. A month ago, we rather suddenly discovered my husband has cancer. Stage IV Renal Cell Carcinoma (Clear Cell), if you care for the specifics. We have a big, big monster to slay so we’ve left Alaska and got him set up in Seattle for care there. Family first. I’m very thankful to my co-workers, school, and district for their agreement in that belief. Invention: Now, I know many teachers do this all the time: deliver content online to students. And I am generally moving my few electives to blended-style courses that can be (mostly) accessed asynchronously. This week, though, I’m designing a series of lessons that my co-teacher will help deliver in person to our MS ELA class so that when I’m back in person, we keep carrying on. It’s a read-aloud. I love reading aloud to students. So why let a few thousand miles interfere with that? Here’s a video I recorded for my class where one-take dorkiness abounds. If you’re looking for a fun elementary/middle grade read aloud to do this Spring, look up The Wild Robot and The Wild Robot Escapes, by Peter Brown. PS. Some friends set up a social media campaign of encouragement for us in this cancer journey; check out #stadingstrong on Facebook, IG, and some on Twitter. Why, you might wonder, am I up watching when I have never really paid attention to giraffe cams, or other animal cams for that matter, ever in my life? It is the Monday after time change I certainly should be getting some rest. 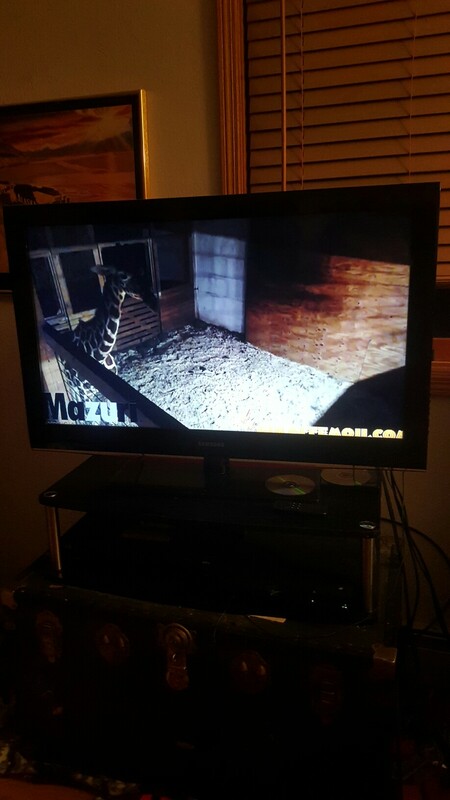 But instead I’m streaming a giraffe from New York. Why indeed. Well, because I can. I have high speed internet and the zoo has a sponsor providing the streaming. (For real, if I ever needed exotic animal food I would buy it from a company called Mazuri.) There is no one else awake to tell me how boring it is to watch an animal walk around. I’m enthralled and I’m not the only one. This is the world we have. We connect over animal cams while waiting for a calf to be born. We read Facebook posts about how watching this giraffe helps people in time of grief or depression just by seeing and sharing the animal’s life as well as the promise of new life. All the while we’re learning about giraffes. I know more about giraffes now than I did three weeks ago and no one made me learn it. Where is this in the classroom? Are we following students’ interests and helping them connect with others? Because that cause is as much my reason for watching April. It reminds me THIS is what learning learning looks like: 16 feet tall and beautiful. Good luck, April. And good night. I’ll check on you in the morning with your 80,000 other fans.